Baer Inc. dba Baer Brake Systems (“BAER”) has developed the following California Proposition 65 mandated labeling in compliance with the State of California’s revised regulations that are in effect as of August 30, 2018. Following a review of BAER’s manufacturing and sourcing supply chain, BAER has determined that its products and packaging generally contain nickel and trace amounts of Toluene-diisocyanate which are on California’s Office of Environmental Health Hazard Assessment (“OEHHA”) Chemical Database. Nickel and Toluene-diisocyanate are both cited as potentially causing cancer according to the State of California’s OEHHA. Therefore, pursuant to the Prop 65 compliance regimen, Baer will be taking the following actions as of August 30, 2018. 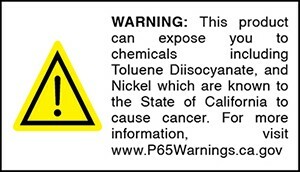 A graphic depiction of a Yellow Triangle containing an exclamation point; and the Language “WARNING: This product can expose you to chemicals including Nickel and Toluene-diisocayanate which are known to the State of California to cause cancer. For more information visit www.P65Warnings.ca.gov. We at BAER appreciate the opportunity to continue to provide you with the very highest quality brake and suspension products.